I remember like it was yesterday. A distinguished boxer arrived riding in the back seat of a volunteer’s car. The car pulled into the driveway where I was waiting and ‘Bogey’ glanced at me through the tinted window. It was just before Labor Day weekend 2008. Susan had called me a few days earlier asking if I was ready for another foster. “He’s an older boy who wandered onto someone’s property in Central Florida. We think he’s 7, maybe a little older, he has arthritis, hip dysplasia and he’s skinny”. An older boxer? At first I wasn’t sure. 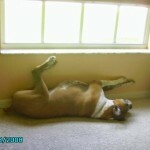 I had only fostered younger boxers and my own boxer only lived to 6.5. I hadn’t dealt with such health issues. On the other hand, the young ones I fostered were handfuls, to say the least. No manners, not potty/house trained and almost wild with energy. One tore up the couch, my shoes, glasses…another jumped through a screen to chase a cat. I might as well give the older boy a place to relax and rehabilitate. Little did I know, my best friend had arrived, that he was GOLD disguised as a senior boxer. Where the previous 6 boxers had to be taught a routine, manners, and get basic training, Bo just immediately fit in and adjusted to the household and established his roles: from office manager (I worked at home and; he KNEW when I should be in the home office), neighborhood watch (making sure nothing was going on that shouldn’t be), to therapist (foster mom had a teenage daughter). However, the biggest role he would go on to fill was caretaker for over 20 other foster dogs. Bo soon decided he was home. I definitely wasn’t looking to adopt a senior boy with arthritis and bad hips, but I’m grateful Bo knew better. 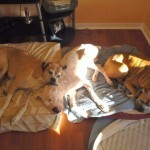 Continuing to foster, Bo showed a special affinity to younger dogs who were neglected – emotionally, medically or both. “This is YOUR foster baby, Bo. You need to help him/her feel better”. He always understood and took his role very seriously. Some of the most memorable of his charges: a young boy left abandoned in an outdoor crate, who had all but had given up. Two demodex puppies who were in dire need of medical care and socialization, another demodex young girl who was found as a stray and in extreme pain. Bo loved and protected them all. More than that, he was completely devoted to his family. When I got news my father passed away, Bo was there to comfort me. He was beyond my best friend. He was my teacher, manager, therapist and more. On October 10, 2013, he told me it was time for him to go. I held him tightly, kissing his gray face as he crossed the Rainbow Bridge. I miss my best friend. Gilmore was picked up from Animal Control the week after the 4th of July, 2012. 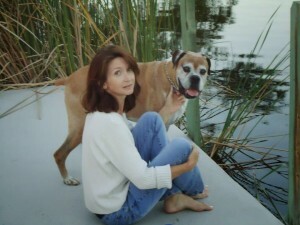 I remember the day like it was yesterday, this was my first rescue dog with Florida Boxer Rescue. All I knew was he was an older boy found as a stray that the owners did not want back. So out walks this dog on wobbly back legs and a mass on one of his back legs. The girl I was with reached for the leash that the officer was holding out to her and Gilmore pulled to my direction, and she said, “Well it looks like he picked you.” We walked outside and I asked her to take a photo of us because I was excited I had saved my first boxer, or I thought. I bent down and out of nowhere he gives me a big old boxer kiss. He was taken to the vet to be checked over. This is where all the bad news came from. He was estimated to be about 10-11, he was heavy heartworm positive and had what we thought was hip dysplasia. The decision was made to not treat him for heartworms as he ran a great risk of not making it through treatment because of his age. The decision was also made that Gilmore would be a Compassionate Care dog and would live out his life in a Foster Home until that time came to cross the bridge. It took about 3 months for everyone to realize there was more going on with his back legs then just hip dysplasia. Through observation and a lot of reading we are pretty sure it is DM (Degenerative Myelopathy). There is no testing for DM. It is an incurable spinal cord disease that targets older dogs. The easiest way to explain DM is to say it is like Multiple Sclerosis in humans. DM first causes weakness in the back legs, then lack of coordination in the hind end (this is where Gilmore was when we got him) until eventually paralysis occurs. DM does its damage to the spinal cord by first deteriorating the myelin that insulates the nerves. Then DM wears on the nerves themselves, which disrupts their workings. The degeneration of the nerves in the spinal cord continues until they can no longer transmit communications between the brain and the muscles in the back legs and the hind end becomes paralyzed. From the onset of the disease, it can take anywhere from six to 36 months for a dog to become paraplegic. Eventually, the impact of DM also leads to weakness in the front legs and finally, respiratory failure. Gilmore is now at the stage of being paralyzed in the back end. Before Gilmore became paralyzed he attended aquatic therapy along with home therapy. Gilmore will use his cart from time to time, however we are working hard at keeping his muscle strength up in his front legs so that he can still hold his upper body up when he wants to, it also makes eating and drinking easier on him as well. To learn more about Compassionate Care dogs like Gilmore and donate toward their care please visit our Compassionate Care Page. Tail #4 – Making a Difference! There is no better, best friend, than a rescue dog. I adopted August when he was 8 weeks old. 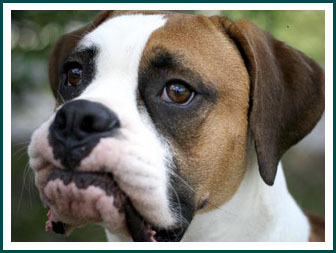 He was born into rescue when his pregnant mother was surrendered to Florida Boxer Rescue. August’s foster mom put the infant puppies through a program called “super puppy”, a series of simple exercises designed by the military to create a breed of canine that is smarter and easier to train. This program possibly gave August a balance and confidence that makes him the most even tempered dog I have ever met. August accompanied me to a botanical garden show, where upon meeting him a lady commented, “What a perfect pet therapy dog he would make!” This was something that had never occurred to me and I decided to pursue it . 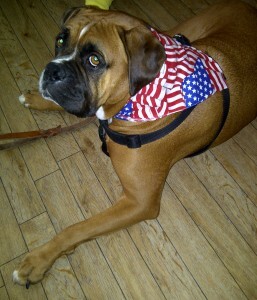 August earned his “Canine Good Citizenship” certificate in June 2012 and was accepted as a Hospice Volunteer. At least once a week August makes rounds at Hospice House and nursing homes, bringing to many a little respite from sickness, pain, and loneliness. I have witnessed an unspoken communication between human and canine that never ceases to leave me in awe. Dogs have a “sense” that we humans either never developed or lost eons ago. Truly, our best, best friends, our loving companions, are our dogs. Our volunteers give their time and themselves daily to patients and their families without reservation. Recently I had the privilege of witnessing this unselfish act of giving firsthand by a volunteer and her pet therapy animal. Terri Farless and August, a 4½-year-old boxer, spent several days with a 5-year-old child while her mother was at the Sun City Center Hospice House. This allowed the family to devote their time to the patient knowing the child was safe with August and Terri. Each day, a small figure would appear at my office door asking, “Is August coming today?” To which I would reply, “He will be here in just a little while.” They walked in the garden, read books, drew pictures, and shared secrets, hugs, and wet “puppy kisses.” August arrived every day full of energy and left physically exhausted having given his friend both his energy and love. On his first visit to the house after the family’s departure, he headed straight to the locations where he always found his charge ready to serve. Not finding his friend, he moved on to assist another leaving his “paw print of love” on a young girl’s heart at a time she needed him most. A huge thank-you to all the volunteers with pet therapy animals who visit out patients daily and make such a difference in their lives. Tail #3 – Who Saved Who? It does not seem possible that it is just a year, it feels like she’s has always been here with us. Jim and I were devastated when we had to put down our 15 year old basset hound Riley. We swore that there would be no more dogs EVER. We were going to travel and do all sorts of stuff….well that lasted about three months. We adopted an older boxer mix from the humane society, who sadly did not like any one but us. She went full throttle through the pool cage trying to get to the neighbor’s bijon. We cried for days when we had to surrender her back to the shelter. We really liked the boxer part of her, so we decided to just foster and not get too attached. I went online to FBR and filled out the application. Are you kidding me? I think it is easier to foster a child. We requested an older boxer with soft ears and docked tail. Did not want to the puppy training again. It was not long after the home visit and and we were approved to foster that we got the call. Kristi and Laura pull in the drive with this scrawny little girl maybe 5-6months at most with a huge suture line on her back haunch going down her leg. We all sat down in the kitchen with three bottles of pills and all the doctors orders, all the time thinking we are just going to foster until she gets healed. Yeah right. Little did we know then that she would, more than a year later, be sprawled on the bed watching me write this story. I think she knows it is about her. She was all pink, chest belly around her snout and even the inside of her nose is still pink. She was wearing a huge pink harness that on a better day she could have wiggled out of. She was very shy and her head was down. Laura said I know this is not the dog you requested but this little girl just needs a quiet environment to heal and some love Just try it and if it doesn’t work for either just give us a call. The moment they pulled out of the drive it was a done deal. You should see her now. She a 60 pound beauty and we never tire of folks stopping us on the streets and saying what a beautiful dog she is. She is so smart it’s like she figure things out. She earned her Canine Good Citizen certificate this past spring. Now we can take her into nursing facilities and schools. She does the Rosie sandwich…..that is wedging her self between us, in the bed on the couch and in the car, Thank you Florida Boxer Rescue for bring this wonderful creature to us, more than saving her, she has saved us. People say “why rescue”? I often hear that you cannot bond enough with a rescue dog like you can with a new puppy, or rescue dogs all have issues or they would not be in rescue. My experience with dog rescue is that there are amazing dogs in foster homes waiting for a chance and a forever family…diamonds in the “ruff” if you will. 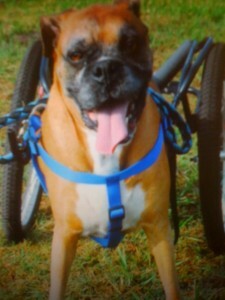 I adopted my Boxer, Raven, at the age of nine months from Florida Boxer Rescue on 2/16/02. She had been found as a stray by Manatee County Animal Services, and no one came to claim her. When I arrived at the foster home, she was flying around the yard at full tilt. Her left ear was permanently damaged, she had no training and her energy level was too much for the others who looked at her before me. I was looking for an agility dog, so the energy level was perfect for me. Little did I know what I had on the end of the leash. We began competing in agility in November 2002. With the help of some great instructors and hard work, we learned to be a true team and excel. 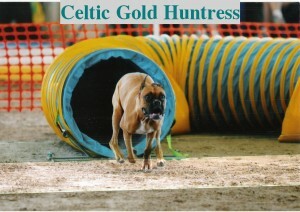 We had a great agility ride from rescue Boxer to a three time American Kennel Club Master Agility Champion. * 12/02/07- attended AKC Agility Invitational – made the finals & finished 7th out of 80 dogs in her height class. 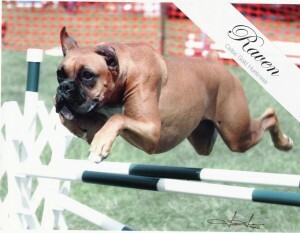 *Remains the #3 Lifetime AKC Agility Boxer in the country at this time. We made many great agility friends along the way and across the country. Raven loved the game and always ran with great heart and had an amazing and loving spirit that touched everyone she met. Sadly, Raven was diagnosed with lymphoma on 11/11/08, and she lost her battle with the disease on 1/28/09. I would trade all of our agility runs for one more day with my most special heart and soul dog. Thank you to Florida Boxer Rescue for taking this once stray dog out of a shelter, vetting her and placing her in a safe foster home. To commemorate the one year anniversary of my Boxer Brutus’s passing, I thought I’d share a story about just how amazing he was. When Brutus and I met, it was truly love at first sight. It was December 12, 1999, and I pulled up into the driveway of a person who had contacted FBR, asking that we take him into our program. Brutus wasn’t yet two years old; he was a typical adolescent Boxer with a healthy supply of energy (and then some), but wasn’t getting the attention he required or deserved. When I saw him out in the yard that morning, I knew I wouldn’t put him into foster care – he was coming home to live with us. Brutus was a huge, beautiful brindle boy with cropped ears and an outstanding “personality.” He officially won me over on the car ride home because he sat backwards in the front seat so that he could make google-y eyes at our baby in the back. He would not take his eyes off the baby for anything. It was the first of many signs of his fondness for our children. Whenever I needed Brutus, there he was…one step ahead of me, slipping quietly up on the couch for a cuddle session. He gave meaning to the infamous term, “velcro dog.” I can’t count the number of times I tripped over his 90 pound frame because he was my constant shadow. Brutus wouldn’t listen to a word my husband said, but would do anything I wanted him to do. The devotion went both ways. I loved that dog like no other. 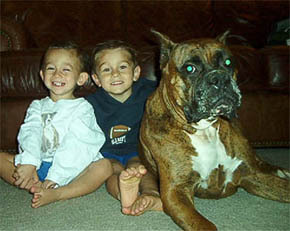 When my younger son Max passed away in a hospital on December 24, 2005, Brutus and his Boxer brother were at doggie daycare. When we picked the dogs up the following day, Brutus was clearly at a loss, whining quietly in the back while looking over the seats at the empty booster chair my son, (his special buddy), would normally have been occupying. Over the next two weeks, I believe that Brutus was particularly sensitive to my thoughts and concerns. He became extra clingy, perhaps trying to be of comfort to me; he knew “his” boy was gone. On January 9, 2006 he went for what was to be his last walk with me. The day was cold and very gray. It was just the two of us and I talked to him about how I was feeling and he cocked his head to the side like he always did, and “listened.” I remember how his soulful brown eyes looked up at me as I told him I was worried that Max was lonely or sad where ever he was. When we returned home, Brutus followed me upstairs and then promptly collapsed on the floor at my feet. Brutus died that morning – just 16 days after my son did. Some may be skeptical, but I believe that my Brutus thought he’d be more of a comfort to me by going to be with my son. For this, I will eternally be grateful to him. 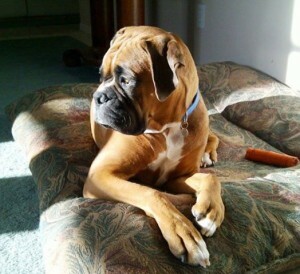 Brutus was someone else’s throw-away Boxer, but he will forever be my HERO.